Freedom has come for 12-year-old Faith Nwanja, who passed through a dehumanizing ordeal for four years in the hands of a relative. 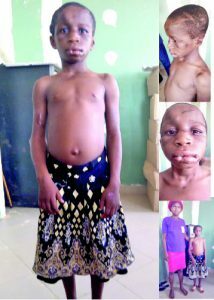 The disfigured girl, a native of Okofia community in Ezza South Local Government Area of Ebonyi State was rescued through the facilitation of the Ebonyi State Ministry of Women Affairs and Social Development, Abakaliki, after her long traumatized mother made a plaintive appeal for assistance in freeing her daughter from captivity. Her kinswoman, (name withheld) who also hails from the same Okofia community in Ezza South and took Faith to live with her in Onitsha, Anambra State, subjected her to all manner of inhuman treatment. Faith told a chilling story of how her mistress often chained her up in their apartment and beat her with knives, wire and other dangerous objects. The worst of the tortuos treatments was that the kinswoman on several occasions inserted sticks into the young girl’s genital, an act that left Faith with bruises in the private part. The road to captivity and torture began for Faith at the age of eight, when the kinswoman took her away. Before leaving the community with Faith, Sunday Sun gathered that she had promised the girl’s family that she would treat her like her own. But as soon as they arrived at her abode, Faith narrated that her mistress began to unleash hell on her. In fact, she got a foretaste of what awaited her when her mistress gave her hard knock on the head while they were on the way to the city. A cursory look at Faith recalls what she passed through in the hand of the evil mistress and left the clear impression that the little girl had literally been to hell and returned. All over her body are scars of different sizes. Her face is swollen with her lips larger than normal. Her right hand is stiff and virtually immovable. As she said, the injury was inflicted on her by her mistress, and she also denied her adequate treatment. Faith, who is now undergoing medical treatment and psychological rehabilitation in the protective custody of the ministry narrated her heartbreaking ordeal. Her words: “Nkechinyere my madam disfigured me like this. I was able bodied when she took me to Onitsha. She inserted her fingers in my eyes and inflicted these injuries on them. “She used stones to brush my teeth forcefully. She said that I don’t brush my teeth well. She would always punish me by using stones to clean my teeth. “Her husband never beat me. He usually felt bad and seriously annoyed seeing how his wife tortured me. Sometimes he would quarrel with her. “After beating me, she would lock me up in a dark room. It was the sister of my madam that took me home. She told my madam to take me home but she refused. My madam used to tell me that nothing would happen if I died, that she would spend her money and regain freedom if she was arrested. Continuing the pathetic story, Faith said: “When I was with my mother in the village, I was going to school. But since the four years my madam took me to Onitsha, I have not gone to school. I only ate in the evening every day. Faith’s mother also narrated that their kinswoman did not obtain her consent before taking her daughter away to Onitsha. She explained that she made efforts to get her daughter back without success. “On a certain day, I went to the farm only to be told by my neighbours that she had taken my daughter away. I called her on phone to return my child that Christmas so we could discuss terms. But to my surprise, she began to query me, asking who gave me her number. After that day, she switched off that phone line completely. There was no way I could reach her for four years,” said she. Officials at the Ebonyi State Ministry of Women Affairs and Social Development, which is currently handling the matter, have vowed that it would not leave any stone unturned to ensure that the little girl got justice. The Head, Department of Child Development in the ministry, Mr Godwin Igwe, said that the state police command had already arrested the kinswoman alleged to be responsible for the ordeal of the girl. He told Sunday Sun that the kinswoman had allegedly vowed to use her money and connections to subvert the course of justice but Igwe assured that the Ebonyi State Government would truncate such effort and ensure that the little girl got justice. Escorts in Lahore are our girls’ world class escorts, as well as give call services. They take into account the customer base in Lahore in every single wealthy territory. We additionally have girls that offer outcall services. The smartest Hot Lahore Escorts will go with you outside Pakistan cheerful to satisfy your wants.